If you have seen any of the R7 models - the Oppo R7 or R7s or R7 lite, then you could easily confuse the F1 for being just another member of this device family (there is also a R7 Plus, in case you were wondering). 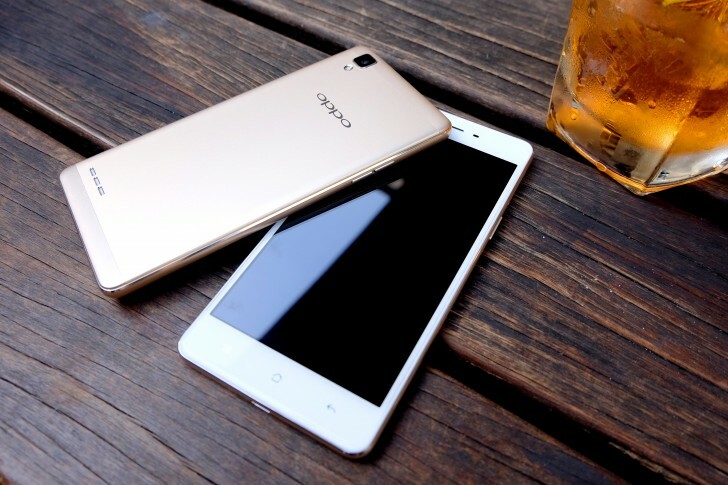 The design is almost identical and Oppo has also endeavored to carry over as much of the materials and build quality it can. The F1 is advertised as being made of an metal alloy and you can tell it's metal by the way it can become really cold, though Oppo's description is anything but straightforward - "an exquisite metal alloy, treated with zircon sand surface coating applied in a low-pressure, low-speed spraying process". However, we can't wholeheartedly agree with the "exquisite" part. Due to the soft touch finish it doesnt really feel like metal. There is no actual flexing or give in the body to complain about, but the back just doesn't feel quite right to the touch. Also, we are fairly certain that the frame is not metal, although they still feel and look just as nice. Speaking of which, Oppo also puts a lot of accent on the fine details in the F1's curves. It is nice to see that the 2.5D display glass has been carried over from the R7 line and the rest of the, so-called "Micro-arc" frame generally fits nicely as an extension to the existing angle of the screen curvature. As for the controls on the F1, Oppo has stuck to the familiar R7 distribution. The front of the device is clean. Despite its lofty aspirations, the selfie shooter is still relatively small, so it doesn't stick out like an eyesore. Beneath the screen there is a standard set of thee capacitive navigation buttons. The touchscreen itself doesn't feel as responsive as we're used to, but it might be due to the factory pre-applied screen protector though that would be a first. Anyway, you would probably be fine without it either as the front glass is Gorilla Glass 4. As for the back of the phone, we already had our say about how the metal feels there. A soft touch finish on a metal back just doesn't feel right to us - but that's nitpicking. The signature square camera is placed in the left upper corner and so are the two plastic segments on the top and bottom. There are also the cutouts for the speaker. The two sides are the typical affair as well. On the left there is only a volume rocker, while on the right we have the power button and hybrid dual-SIM/microSD card tray. The top of the phone only has a lone 3.5mm audio jack and the bottom isn't much busier either, with a micro USB port, flanked by the main microphone. The display is one area where the Oppo F1 definitely punches below its price range. As already mentioned, $250 can definitely buy you a FullHD panel from a variety of other vendors. At 5.0 inches, the IPS, LCD panel is rather underwhelming and doesn't really offer much to impress with. It is the most notable downgrade compared to the R7 and R7s. Still, unless you go out of your way to look really hard, you won't really find any grain or lack of detail on the handset. Much more troublesome, however, are the relatively bright blacks, which subjectively, ruin the contrast for us. The actual value is pretty close to the mean within our database, so, it is more of a subjective observation. Contrast is a little below average, sunlight legibility is also decent. The Oppo F1 is equipped with a 2500mAh sealed in battery, which is perfectly decent for a mid-ranger, especially one with a 720p display. Furthermore, this is a bit more than the R7 and R7 lite, which have 2320 mAh batteries, but still less than the 3070mAh in the R7s. That being said, there is no point in beating about the bush, the Oppo F1 has an underwhelming battery life, at least in our experience with it. It only managed to score an overall endurance rating of 58 hours and that is with only one active SIM inside. Throwing a second one in brings the number down to 56 hours. Talk time isn't particularly bad at 12:53 hours, but it is still only half of what the Oppo R7 is capable of. Web browsing and video playback are also on the low end, but the score is at least consistent with the one on the R7. Besides the talk time, the other real culprit for the significantly lower endurance rating is standby with around 7 to 8 percent easily being drained overnight. Another important note to make concerns Oppo's VOOC technology, or rather, the lack of it. Oppo's patented fast charging tech is still one of the best implementations around, but sadly, the F1 lacks support for it altogether. And it is also not simply a matter of getting a VOOC charger - using one did not help, we tried. Make note that our proprietary score also includes a standby battery draw test, which is not featured in our test scorecard but is calculated in the total endurance rating. The battery testing procedure is described in detail in case you're interested in the nitty-gritties.